Your child may have drainage from the eyes that causes matter to build up in the corners or along the eyelashes. She may have other symptoms as well such as discomfort, eye redness or eyelid swelling. 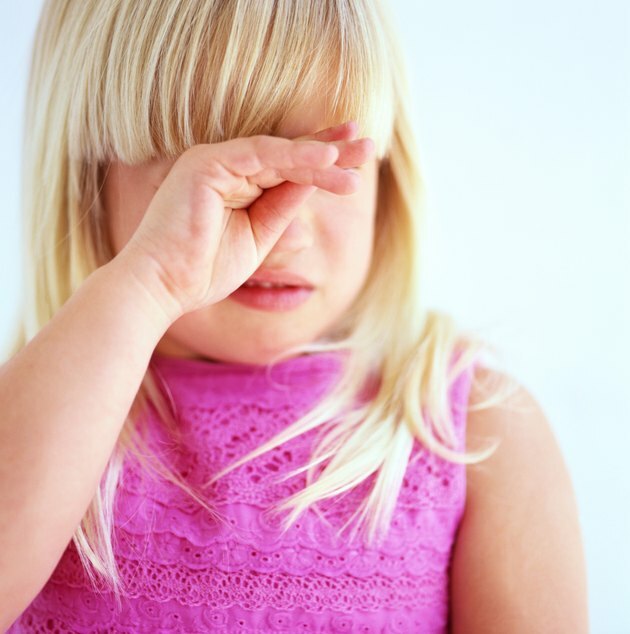 Parents of young children who cannot verbalize their symptoms need to watch for signs such as goopy eyes or eye rubbing to spot warning signs of an eye problem. Knowing possible causes will help you determine how to help your child and when to seek treatment. An eye infection such as pink eye often causes eye drainage. An infection may stem from a bacteria or other pathogen such as a virus or fungus. Viral conjunctivitis typically occurs when your child has a cold. An allergic reaction to pollen or pet dander may also cause drainage. Infants and young children may have a blocked tear duct, and this can cause a thick drainage, often occurring from an infection in the blocked duct. A viral infection such as that caused by the common cold virus does not typically require treatment. The infection and resulting symptoms will clear within a few days or as the virus resolves. If your child experiences severe discomfort or if her eyes swell shut she may require medicated eye drops to help ease the symptoms. Other infections may require antibiotics or antifungal medication. To clear a blocked tear duct in a young child you may need to massage the area of the blockage. If your child's pediatrician recommends this, he will show you where and how to massage the duct. If the duct fails to clear, the doctor may need to perform a surgical procedure to clear the blockage and prevent infections and associated symptoms. Eye drainage will dissipate as the condition causing goopy eyes resolves. In the meantime, however, you may need to clear away the matter in your child's eyes. Overnight, while your child sleeps, the discharge often will dry and clump on the eyelashes; the dried goop may also "glue" your child's eyes shut. To clear the dried matter, dampen a clean washcloth with warm water and hold it against your child's eyes until the discharge loosens. Gently wipe it away with the washcloth. You may need to gently wipe your child's eyes throughout the day with a clean, warm, moistened cloth to help clear the goop from her eyes. If your child has eye drainage and other symptoms of an eye problem, contact a pediatrician. He will determine the cause for the condition and any necessary treatment. You should not use over-the-counter medications to treat your child's symptoms without first consulting the doctor. What Causes Swollen Eyes in Infants?